Marlowe’s Faustus for me is a testament of more far-away and naïve times. Back in the day, you could actually learn all that there was to learn about science in one lifetime. Elena of Troy was the fairest lady that ever lived and there was a limit to the knowledge in general. After all, what is there to know after gathering the names of plants that grow on Earth in one book and confirm the celestial orbits, am I right? That is exactly what happens to Faustus after Mephistopheles shows him what he seeks to know to get his soul. Beyond knowledge is boredom. Chickenshed’s choice of plays is never out of date. These days “Mephistopheles” is artificial intelligence and fracking and many other parts of human activity. Science asks us more and more moral and philosophical questions that we fail to answer, just as Faustus failed. Chickenshed’s take on a 16th-century play reminds us that tangible profits are still at war with intangible, often incalculable humanitarian and environmental costs. Will we recognise Mephistopheles when he comes? Faustus can at least recognise that the devil is a devil. The acting is enjoyable, as usual in Chickenshed. In the main tandem of Faustus and Mephistopheles is gives an engaging performance. Paul Harris was the most memorable: his angel of Hell is dangerous, sleek and confident, simultaneously charismatic and scary. Ashley Driver’s Faustus is not more self-centred than devoted, more sassy than intelligent. He quickly abandons his commitment to science in favour of playing pranks on pope; he seems to be unworthy of the gift Devil. He does not do anything that would make his sacrifice worthwhile. A scientist becomes reduced to a telephone prankster who calls in to tell he slept with your mum. All his thoughts are but current events, laughable from across the centuries. The greatest parts of the show are the visuals and sound effects. 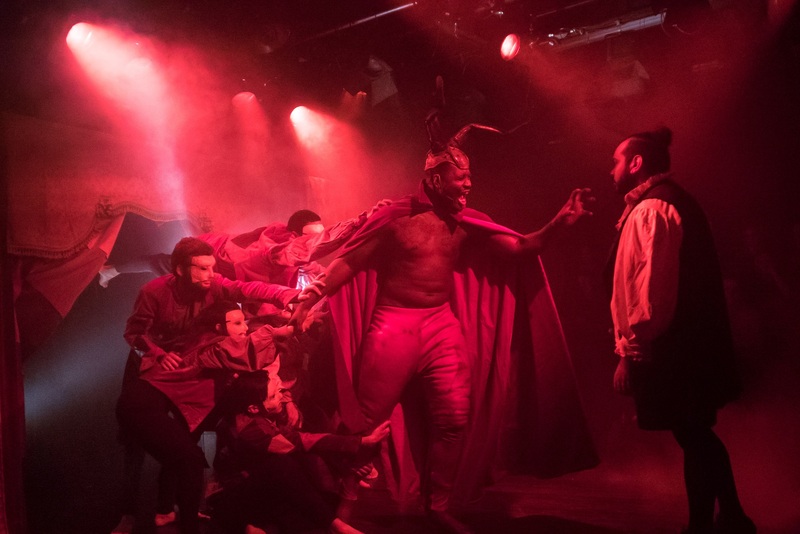 A great lighting work creates a sombre and haunting atmosphere on the set that represents Faustus’ study with an opening to the supernatural on the other side of the stage. The company’s meditative performance submerges in the red and black colours. 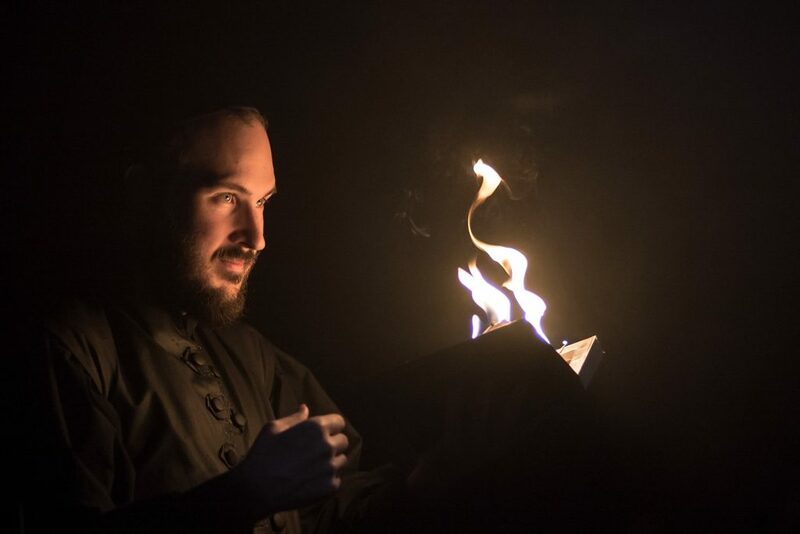 At one point Mephistopheles holds and actual burning book – a great and unexpected effect. Great sound effects – echo sounds and resounding loneliness. The more we know the lonelier and more tormented we become, both collectively and individually. Anxiety and depression will be the plagues for the new century. There is one huge difference between us and Faustus though: the absence of god. For him it’s there, omnipresent, omnipotent. For us it is just one of the things that some people choose to believe. We do not need to care for some arbitrary rules set in a weird ancient text, but on the other hand – there is no-one to prevent us from doing something malicious beyond repair. We are alone, unsupervised children, and we can screw things up past the point of no return. 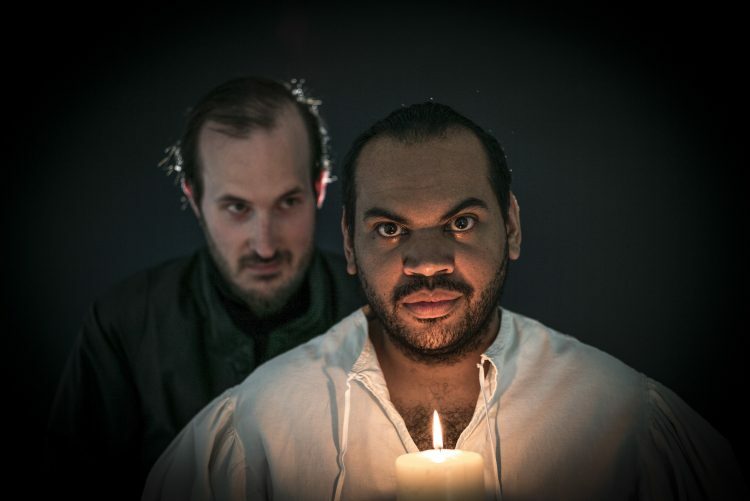 Faustus can repent at any moment – and be saved. We cannot.